Lawmakers in Utah considered and temporarily tabled a plan to expand the state’s sales tax to bring the Utah tax code in line with a 21st-century economy. The Tax Equalization and Reduction Act (HB 441 S1), proposed by Representative Tim Quinn (R), would expand the sales tax base to include nearly all goods and services. The new revenue would pay for reduced tax rates for both sales and income taxes. However, the sales tax expansion also captures a large swath of business inputs. This creates a harmful effect known as “tax pyramiding” whereby economically distortive taxes stack up through the stages of business production, causing retail consumers to pay taxes upon taxes when they make a retail purchase. The legislature does not intend to act on this proposal before wrapping up its session on March 14, leaving the opportunity to adjust the Tax Equalization and Reduction Act for a future session. It’s important to note that the sales tax would be levied on the services of a wide number of industries for which a significant portion of their sales are business-to-business transactions. These industries are referenced in lines 4331-4383 of the bill, including engineering, electrical and HVAC work, manufacturing, trucking, transportation, and banking. 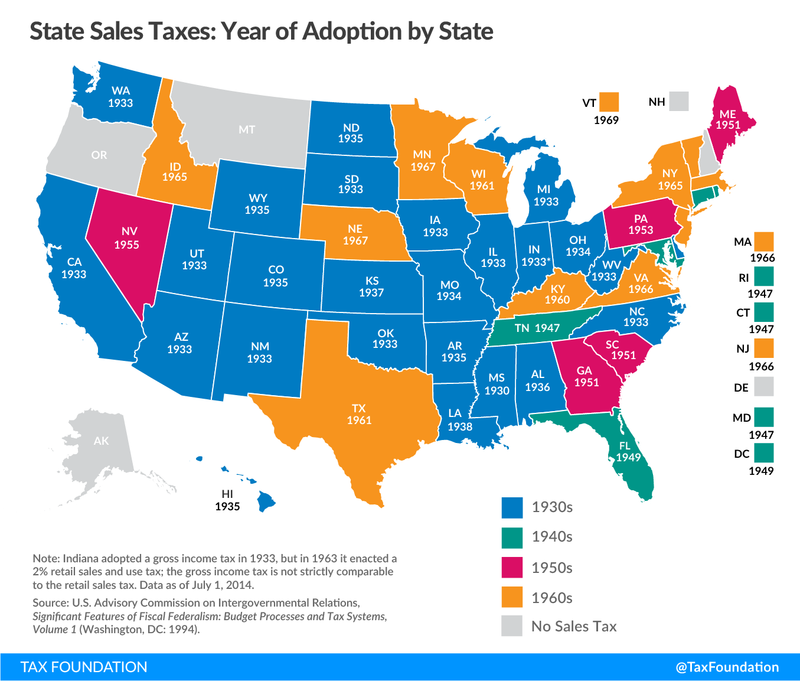 Utah originally adopted its sales tax in 1933, when the sale of tangible goods dominated United States consumer purchases and when the taxation of services would have been difficult to administer for undeveloped tax systems. The U.S. economy has since evolved, and the purchase of services now makes up more than two-thirds of all U.S. consumption. Yet many services are excluded from the sales tax base by this historical accident. The consumption tax base is eroded by omitting services, forcing policymakers to rely on less efficient forms of taxation. The concept behind Utah’s proposed sales tax expansion is in line with sound tax policy. An economically neutral sales tax base should include the final retail sale of all goods and services purchased by end users. When retail service purchases are exempted from sales taxation, the result is a narrower tax base with higher tax rates falling largely on the goods-based economy. Broadening the sales tax base and lowering sales and income tax rates would also create a more stable revenue source for funding government. Further, it would improve transparency in the tax code by taxing consumption more generally and can reduce the tax administration cost of distinguishing between taxable and nontaxable transactions. Utah lawmakers are on solid ground in their aim to expand the state sales tax to include more final retail sales. However, lawmakers should be careful to exempt business inputs from sales taxation lest the benefit of a broad tax base be undone by the harm of tax pyramiding on the multiple stages of business production. All final consumption of goods and services should be taxed within a sales tax base. However, consumption by businesses should be exempted to avoid taxing products multiple times as a producer brings it to market. House Bill 441 S1 would impose a sales tax on a wide range of services for which a significant portion of purchases are business-to-business transactions rather than final retail sales. These services include sectors such as construction engineering, electrical and wiring contractors, plumbing and HVAC services, manufacturing, wholesale trade, air and bus transportation, freight trucking, credit intermediation, investment banking, and real estate brokerage. Business-to-business transactions should be exempted from sales taxation to protect the transparency and neutrality of Utah’s tax code. If business inputs are taxed, then layers of taxes would stack up in each stage of production and add to final consumer cost, and might hamper the economic viability of some production processes. Additionally, final end-consumers would pay taxes upon taxes when they purchase a final product or service. This violates the principle of taxpayer transparency, because the end user would not see the several layers of taxation imputed into the final price of the product or service. Furthermore, such tax layering creates a biased tax code. Products or services with longer production cycles would bear a disproportionate amount of the tax burden, creating the incentive for firms to vertically integrate in order to avoid the layers of taxation from making external purchases. Lawmakers have inherited a nonneutral tax code that favors service consumption over goods consumption. They should not correct this historical accident by favoring industries with shorter production cycles over those with longer production cycles, which is what taxing business inputs would do. Lawmakers can consider replacing some of the revenues lost on business inputs by expanding the retail sales tax to apply to the consumption of fuel (which is subject only to an excise tax for funding public construction) and to groceries (which are subject to a reduced tax rate). The excise tax on fuel functions as a type of user-fee for funding public construction, which does not imply that retail fuels sales should be exempt from the general consumption tax. Furthermore, there are more targeted programs such as the earned income tax credit and grocery tax credit that can provide tax relief to low-income grocery shoppers while avoiding the revenue loss of a broad sales tax reduction. One way to exempt businesses from being taxed on their inputs is to provide them with a sales tax exemption certificate. Utah already has such a structure set up for nonprofits and religious organizations which could be expanded to exempt business-to-business inputs. Utah lawmakers can also protect against revenue volatility by enacting tax revenue triggers so that tax rates drop as revenue targets are met. A broad base expansion is a very positive reform, yet brings with it some uncertainty over when revenues will flow into state coffers as projected. This risk can be mitigated by making rate changes contingent upon meeting baseline revenue projections. Utah can build upon a strong legacy of tax reform and step forward in modernizing its sales tax by expanding its sales tax to the consumption of both final goods and services while exempting business inputs from sales taxation. Utah ranks #8 on the Tax Foundation’s 2019 State Business Tax Climate Index, and could potentially improve its ranking with a well-structured sales tax reform. Utah’s sales tax ranking is its weakest component in the Index, which penalizes states for having too narrow a sales tax base and for layering taxation upon business inputs. Utah could improve its economic competitiveness, and thus its Index ranking, by enacting an ideal sales tax reform. Utah’s ranking would move from 16th to 6th on sales taxation and 8th to 5th overall by extending the sales tax to all final consumption while exempting business inputs and marginally reducing rates. While Utah’s legislative session ends March 14th, tax reform is an ongoing process to be continued in a future legislative session. Utah’s next steps in tax reform will show how well a state can manage the trade-offs of enacting an ideal sales tax.